The word encephalopathy originates from the Greek word ενκεφάλη (inside the head) and πάθος (suffering). The ancient Greeks used this word when they wanted to indicate a disease or suffering inside the head. In clinical practice, the word metabolic encephalopathy was used for the first time in 1912 when Kinner Wilson tried to explain the state of global cerebral dysfunction caused by systemic stress, which can vary in the clinical picture from a very mild disorder to deep coma with decerebrate rigidity. Metabolic encephalopathy has usually been defined as a diffuse cerebral dysfunction, typically manifesting as changes in cortical functions and as disorders of consciousness, ranging from confusion to coma. Others have suggested that metabolic encephalopathy is a temporary or permanent illness, more a symptom than a disease, that includes various forms of pathological conditions that are predominantly manifested by disorders of mental functioning. However, metabolic encephalopathy may also be defined as a systemic disorder with diffuse brain damage affecting the hemispheres, brain stem, and reticular activating system. Patients treated in emergency departments and intensive care units usually develop encephalopathy as a result of use or misuse of a large number of medications in the treatment of chronic conditions. These are usually neuroleptics, antidepressants, hypnotics, analgesics, opioids, anti-Parkinsonian drugs, anti-convulsants, antibiotics, depressors of the central nervous system (CNS), immunosuppressive agents, etc. Moreover, patients treated in these units may suffer from psychogenic and posttraumatic conditions, as well as ictal and postictal conditions. Furthermore, encephalopathy can occur in the presence of alcohol and toxin abuse. It is frequent in chronic organ diseases (kidney, lung, liver, heart) associated with electrolyte imbalances (glucose, Na, Ca, Mg, PO4, urea, creatinine, pancreatic enzymes, cardiac enzymes, etc.) and osmotic disorders. These patients usually have frequent infections such as urinary and/or respiratory tract infections. Encephalopathy may also develop in primary infections of CNS, as well as due to the prolonged effect of anesthetics and sedatives. Pathophysiological mechanisms of encephalopathy are not fully understood. It is considered that vascular effects and the effects of toxins and infections, have the most important role in its development.,, Damage to the brain–blood barrier causing disruption of the amino acid and neurotransmitter systems is considered to be an important factor. Due to the inadequate functioning of the neurotransmitter systems within the brain, various consequences can occur such as focal or global edema, accumulation of toxic metabolites, capillary vasogenic edema, as well as depleted energy processes. The complete pathophysiology of encephalopathy is unknown; however, in encephalopathy associated with sepsis, several mechanisms have been proposed. Inflammation triggers endothelial activation in the brain, which leads to malfunction of the blood–brain barrier. Consequently, this leads to the release of inflammatory mediators such as cytokines and chemokines, which enter the brain parenchyma, causing damage to the cellular metabolism. Furthermore, cellular dysfunction initiates oxidative stress and mitochondrial dysfunction, which cause the disruption of neurotransmission and leads to apoptosis. The cholinergic, gamma-amino butyric acid (GABA), beta-adrenergic, and serotonergic systems are altered and neurotransmission functioning is damaged, especially in the neocortex and hippocampus. Additional factors in this neuroinflammatory process are the release of excitatory amino acids, hyperglycemia, neurotoxic pharmacological agents, hemodynamic changes, coagulopathy, and hypoxemia. Different mechanisms operate in encephalopathy caused by medications or toxins. Increase in the glutamine and glutamate complex peak in magnetic resonance (MR) spectroscopy illustrates the neuronal and astrocytic excitotoxic injury during the administration of acute intravenous immunoglobulin therapy. The use of valproic acid, 5-fluorouracil, carbamazepine, and acetazolamide may cause the inhibition of urea cycle enzymes with consequent hyperammonaemia and encephalopathy.,,, Interaction through GABA receptors occurs during intrinsic valoproate toxic effects or due to direct topiramate toxicity. The combined antiepileptic valproate and topiramate therapy causes reduction of topiramate metabolism through cytochromeP 450 pathway. Cephalosporins may also induce encephalopathy through GABA A receptor inhibition. It has been proposed that acute confusion may occur through two major mechanisms, namely a decrease in the central cholonergic activation (characterizes delirium) and an increase in the proinflammatory cytokine concentrations (interleukin 8, tumour necrosis factor alpha, interleukin 10). The clinical presentation may sometimes include extrapyramidal signs (in cases of hyperbilirubinemia or kernicterus) as well as cerebellar ataxia (in cases of hypothyroidism, celiac disease or hyperthermia). However, these symptoms are rarely seen. The diagnosis of encephalopathy is based on clinical features and arterial blood gas analysis, laboratory analysis of blood biochemistry, electroencephalography (EEG), somatosensory evoked potential (SSEP), and imaging methods [multislice spiral computed tomography (MSCT) and magnetic resonance imaging (MRI)]. Arterial blood gas analysis is used to evaluate respiratory, cardiovascular, and metabolic functions. It represents a very important step in the emergency services because it may provide a quick answer regarding the content of oxygen and carbon dioxide in the blood. However, in addition to this basic information, arterial blood gas analysis also provides a quick orientation on the electrolyte status (Na, K, glucose) as well as bicarbonates. Based on this information, clinicians can further focus the search on the detection of the underlying etiology of encephalopathy [Table 2]. After the interpretation of the arterial blood gas analysis, evaluation of the complete blood count (CBC) and biochemistry should be performed. CBC analysis provides information regarding the potential presence of anemia, or of variations in hematological indices such as leukocytosis or leukopenia, and thrombocytopenia or thrombocytosis. A high erythrocytic sedimentation rate usually points to the existence of infection and/or autoimmune disorders. It may be registered in various types of anemia, thyroiditis, nephrotic syndrome, cardiac diseases or malignancies. The spectrum of biochemical analysis of blood levels that is required includes glucose, urea, creatinine, uric acid, bilirubin, as well as electrolyte levels (the latter including sodium (Na), potassium (K), magnesium (Mg) and calcium (Ca) levels), as well as aspartate aminotransferase (AST), alanine aminotransferase (ALT), gamma-glutamyl transpeptidase (GGT), lactate dehydrogenase (LDH), creatine phosphokinase (CK), and C-reactive protein (CRP). Each of these biochemical parameters may point to the potential cause of encephalopathy. For instance, elevated levels of urea, creatinine, and uric acid followed by electrolyte dysfunction and anaemia indicate the presence of a kidney disease. Hyponatremia is usually recorded in patients in intensive care units as well as in patients taking some types of chronic therapy (e.g., the prolonged use of diuretics). In the cases having sepsis, fever accompanied by elevated levels of leukocytes, CRP, procalcitonin, and other laboratory abnormalities (anemia, disseminated intravascular coagulation (DIC), increased transaminases, bilirubin, etc.) may be registered. The main markers of septic encephalopathy are neuron-specific enolase (NSE) and calcium-binding protein beta (S100β), which are shown in studies to be the main predictors of the occurrence of septic encephalopathy. In cases in whom the biochemical analysis of blood does not explain the reason for disorders of consciousness, more specific parameters should be investigated such as the ammonium ion, phosphorus, pancreatic enzymes, viruses, toxins and drugs, antibodies, and tumor markers. It is important to perform an EEG and an SSEP as diagnostic procedures in the work up metabolic encephalopathy. In the cases of encephalopathy, EEG can register generalized slowing or suppression of the EEG reactivity, loss of fast rhythm with occurrence of diffuse slow activity (theta and delta), presence of particular EEG patterns (focal or generalized), intermittent activity suppression, or an electrocortical silence., In the patients with hypoglycemia, EEG can register diffuse theta activity with occasional occurrence of specific patterns, e.g., frontal intermittent rhythmic delta activity (FIRDA), or spikes and sharp waves as well as spike-wave discharges in temporal regions. In hyponatremia, EEG detects diffuse slowing in the theta range, followed by paroxysmal delta activity and FIRDA or periodic delta waves, as well as the occurrence of periodic lateralized epileptiform discharges (PLEDS). In hypokalemia, diffuse slow activity can be seen together with paroxysmal delta/theta activity, as well as focal paroxysms of sharp waves and spike-waves during hyperventilation (HV). In patients with cirrhosis, in addition to diffuse slow activity (theta and delta), triphasic waves with bifrontal predominance may be registered. Furthermore, in these cases, other epileptic patterns in the form of spikes or sharp waves can also be detected. However, triphasic waves are not specific only for hepatic encephalopathy. They can also be registered in patients with septic encephalopathy together with diffuse slow theta/delta activity [Figure 1]. Use of SSEPs in the prognosis of coma, especially in the case of ischemic or anoxic etiology, is of particular interest. Some typical changes that are found include an increased amplitude and latency, and changes in the conduction velocity and time-frequency distribution. Neuroimaging procedures of the head, either CT or MRI are important in the diagnosis of disorders of consciousness because they can exclude organic lesions. CT or MRI findings in patients with encephalopathy are usually normal. However, diffuse or focal edema may be registered. Moreover, changes in the signal intensity in the form of hypo- or hyperintensity in certain regions of the brain can also be detected. The region of basal ganglia, thalamus, cerebral cortex, and hemispheric white matter are usually the target of toxic or acquired metabolic encephalopathy. In patients with hepatic encephalopathy, in T1 sequence, a hyperintense signal in the globus pallidus, the subthalamic regions and the brain stem may be registered, whereas in T2 sequence, diffuse edema in the cortical regions (in the form of hyperintensity of perirolandic and occipital regions) can be detected. Deep white matter changes may be seen, with the appearance of hyperintensity on T2 sequences in the region of internal capsule, corona radiata, and splenium of corpus callosum, suggesting a restriction of diffusion. In patients with posterior reversible encephalopathy syndrome (PRES), CT or MRI findings of the head show changes in the white matter in the form of hyperintensity (MRI) or hypointensity (CT), especially in the occipital and parietal regions, although changes may also be registered in the posterior frontal and temporal regions. On the other hand, pathological findings in cerebellum are rarely seen. Hypoxic ischemic encephalopathy usually show normal findings on CT scan performed in the initial hours. However, after 24 hours, the CT scan can register diffuse cerebral damage characterized by reduced attenuation (diffuse edema) in comparison with brain stem and cerebellum. Usually, this is a sign of a poor prognosis. The treatment of metabolic encephalopathy implies the management of the underlying disease that emerged from the evaluation of the neurological symptoms and signs. In case of encephalopathy caused by thyrotoxic crisis, in addition to the standard therapy with glucocorticoids, plasmapheresis has also been recommended. Uremic encephalopathy is treated by dialysis. This type of encephalopathy is never isolated, but is always associated with other metabolic disorders. Therefore, the clinical presentation in these situations is always a combination of the manifestions of several metabolic disorders. In case of hyponatremia, therapy consists of fluid restriction with sodium deficit replenishment. However, serum sodium concentration correction has been limited up to 12mEq/L/day because intensive compensation may result to central pontine myelinosis and favors the further development of encephalopathy. On the other hand, in cases of unknown etiology, urgent therapeutic procedures should be conducted, such as ensuring an adequate respiration and circulation, an arterial blood gas analysis, the biochemical analyses of blood, as well as blood and urine tests to detect toxins. In cases who are in coma or those suffering form acute consciousness disorders of unknown cause, correction of hypoglycemia should be undertaken as well as the administration of antagonists of benzodiazepines and/or opiates (naloxone amp. intravenously). For Wernicke encephalopathy prevention, thiamine (100 mg intravenous) is used. If encephalopathy is manifested by epileptic seizures, the first line of choice are benzodiazepines. In case of nonresponsiveness to this therapy, introduction of antiepileptic medications is recommended. In all patients, X-ray of the heart and lung, head CT, lumbar puncture, and EEG should be performed. If the etiology of encephalopathy still remains unknown, investigation should be expanded to specific blood analyses (ammonium ion, tumor markers, virological analysis of blood, CRP, procalcitonin, toxicological analyses, etc.). Differential diagnosis of metabolic encephalopathy includes various pathological conditions, i.e., alcohol or drugs intoxication, metabolic imbalances (electrolytes, hypo or hyperglycemia, organic kidney damage, and/or liver failure), systemic infections, primary CNS infections, autoimmune diseases, vasculitis, cancer, degenerative diseases (dementia, and Jakob–Creutzfeld disease), traumatic conditions, ictal and post-ictal states, as well as psychiatric disorders (psychoses). The prognosis of patients with metabolic encephalopathy depends on the cause and type of encephalopathy. According to Eidelman et al., mortality from septic encephalopathy depends on the level of quantitative disorder of consciousness, measured by the Glasgow Coma Scale (GCS) score. Consequently, a GCS score of 15 has a 16% mortality, a GCS score of between 13–14 has a 20% mortality, a GCS score of between 9–12 has a 50% mortality, whereas a GCS score of between 3–8 has a 63% mortality rate. Survival statistics of patients suffering from liver cirrhosis and hepatic encephalopathy is less than 50% annually, or less than 25% over 3 years. In patients with hypoxic anoxic encephalopathy, the prognosis is even worse and depends on the length of anoxia. Even when there is a recovery in the first week after cardiac arrest, most of these patients die due to other hospital associated complications. Thus, according to Young, the recovery from cardiac arrest in the hospital is approximately 44%, whereas only 17% will eventually be able to leave the hospital without a severe deficit; the reported recovery from hypoxic encephalopathy is even worse. In conclusion, metabolic encephalopathy represents a serious group of symptoms, originating from various diseases that requires a multidisciplinary approach regarding treatment and follow-up. Papadopoulos MC, Davies DC, Moss RF, Tighe D, Bennett ED. Pathophysiology of septic encephalopathy: A review. Crit Care Med 2000;28(8):3019-24. Angel MJ, Young GB. Metabolic encephalopathies. Handb Clin Neurol 2011;29:837-82. Angel MJ, Chein R, Young GB. Metabolic Encephalopathies. Handb Cil Neurol 2008;60:115-66. Aminoff AJ. Anoxic, metabolic and toxic encephalopathy In Neurology Web Med Sci VII January 2003. Available from: http://edmedia.emory.edu/GStaton/Anoxic,%20Metabolic,%20and%20Toxic%20Encephalopathies. [Last accessed on 2016 Dec 06]. Pitel AL, Zahr NM, Jackson K, Sassoon SA, Rosenbloom MJ, Pfefferbaum A, et al. Signs of preclinical Wernicke's encephalopathy and thiamine levels as predictors of neuropsychological deficits in alcoholism without Korsakoff's syndrome. Neuropsychopharmacology 2001;36:580-8. Vexler ZS, Ayus JC, Roberts TP, Fraser CL, Kucharczyk J, Arieff AI. Hypoxic and ischemic hypoxia exacerbate brain injury associated with metabolic encephalopathy in laboratory animals. J Clin Invest 1994;93:256-64. Bajaj JS, Wade JB, Sanyal AJ. Spectrum of neurocognitive impairment in cirrhosis: Implications for the assessment of hepatic encephalopathy. World J Gastroenterol 2008;14:3609-15. Poordad FF. Review article: The burden of hepatic encephalopathy. Alimet Pharmacol Ther 2006;25:3-9. Supanc V, Vargek-Solter V, Demarin V. Metabolic encephalopathy. Acta Clin Croat 2003;42:351-7. Sanap MN, Worthley LI. Neurologic complication of critical illness: Part I. Altered states of consciousness and metabolic encephalopathies. Crit Care Resusc 2002;4:119-32. Kunze K. Metabolic encephalopathies. J Neurol 2002;249:1150-9. Manno EM. Metabolic Encephalopathies. In: Gross RA, Mink JW, editors. Emergency Management Neurocritical Care. Oxford, UK, Wiley-Blackwell Publications; 2012 pp 155-61. Kaplan P, Rossetti A. EEG patterns and imaging correlations in encephalopathy: Encephalopathy part II. J Clin Neurophysiol 2011;28:233-51. Fontera JA. Delirium and sedation in the ICU. Neurocrit Care 2011;14:463-74. Sharshar T, Polito A, Checinski A, Stevens RD. Septic-associated encephalopathy-Everything starts at a microlevel. Crit Care 2010;14:199-200. Hellstrom IC, Danik M, Luheshi GN, Williams S. Chronic LPS exposure produces changes in intrinsic membrane properties and a sustained IL-β-dependent increase in GABAergic inhibition in hippocampal CA1 pyramidal neurons. Hippocampus 2005;15:656-64. Lacobone E, Bailly-Salin J, Polito A, Freidman D, Stvens RD, Sharshar T. Sepsis-associated encephalopathy and its differential diagnosis. Crit Care Med 2009;37:331-6. Wada A, Yoshida R, Oda K, Fukuba E, Uchida E, Kitagaki H. Acute encephalopathy associated with intravenous immunoglobulin therapy. AJNR Am J Neuroradiol 2005;26:2311-5. Aires CC, Van Cruchten A, Ijlst L, de Almeida IT, Duran M, Wanders RJ, et al. New insights on the mechanisms of valproate-induced hyperammonemia: Inhibition of hepatic N-acetylglutamate synthase activity by valproyl-CoA. J Hepatol 2011;55:426-34. Advani PP, Fakih MG. 5-FU-induced hyperammonemic encephalopathy in a case of metastatic rectal adenocarcinoid successfully rechallenged with the fluoropyrimidine analog, capecitabine. Anticancer Res 2011;31:335-8. Adams EN, Marks A, Lizer MH. Carbamazepine-induced hyperammonemia. Am J Health Syst Pharm 2009;66:1468-70. Kim JM, Ryu WS, Hwang YH, Kim JS. Aggravation of ataxia due to acetazolamide induced hyperammonaemia in episodic ataxia. J Neurol Neurosurg Psychiatry 2007;78:771-2. Miyazaki C, Kamijima K, Ichikawa M. Effect on sodium valproate (VPA)-induction cerebral amino acids: Mechanism of gamma amino butyric acid (GABA) elevation and possible causal relation of VPA-induced encephalopathy and glutamine level. Chem Pharm Bull 1988;36:3589-94. Grill MF, Magati R. Cephalosporin-induced neurotoxicity: Clinical manifestations, potential pathogenic mechanisms, and the role of electroencephalographic monitoring. Ann Pharmacother 2008;42:1843-50. Krishnan V, Leung LY, Caplan LR. A neurologist's approach to delirium: Diagnosis and management of toxic metabolic encephalopathies. Eur J Intern Med 2014;25:112-6. Katramados A, Varelas PN. Encephalopathy. In: Torbey MT, editor. Neurocritical Care. New York, Cambridge University Press; 2010 pp. 220-6. Surtees R, Leonard JV. Acute metabolic encephalopathy: A review of causes, mechanisms and treatment. J Inherit Metab Dis 1989;12:42-54. Teasell R, Dittmer DK. Complications of immobilization and bed rest. Part 2: Other complications. Can Fam Physician 1993;39:1440-2, 1445-6. Verma AK, Roach P. The interpretation of arterial blood gases. Aust Prescr 2010;33:124-9. Bochen K, Krasowska A, Milaniuk S, Kulczyńska M, Prystupa A, Dzida G. Erythrocyte sedimentation rate – An old marker with new applications. J Preclin Clin Res 2011;5:50-5. Scaini G, Kozuchovski Ferreira G, Streck EL. Mechanisms underlying uremic encephalopathy. Rev Bras Ter Intensiva 2010;22:206-11. Nagler EV, Vanmassenhove J, Van der Veer SN, Nistor I, Van Biesen W, Webster AC, et al. Diagnosis and treatment of hyponatremia: A systematic review of clinical practice guidelines and consensus statements. BMC Med 2014;12:231. Zenaide PV et Gusmao-Flores D. Biomarkers in septic encephalopathy: A systematic review of clinical studies. Rev Bras Ter Intensiva 2013;25:56-62. Kaplan PW. The EEG in metabolic encephalopathy and coma. J Clin Neurophysiol 2004;21:307-18. Kaplan PW, Rossetti AO. 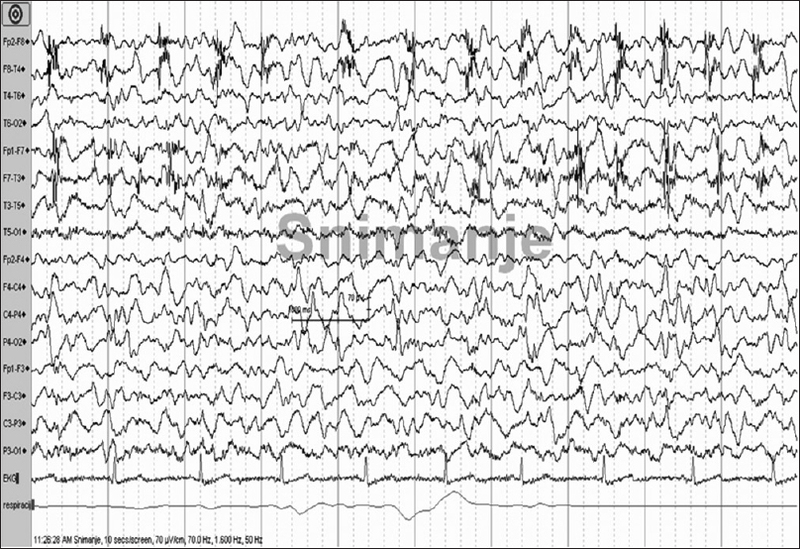 EEG patterns and imaging correlations in encephalopathy: Encephalopathy part II. J Clin Neurophysiol 2011;28:233-51. Faigle R, Sutter R, Kaplan PW. The electroencephalography of encephalopathy in patients with endocrine and metabolic disorders. J Clin Neurophysiol 2013;30:1-25. Glaser GH, Levy L. Seizures and idiopathic hypoparathyroidism. A clinical-electroencephalographic study. Epilepsia 1960;1:454-65. Marchetti P, D'Avanzo C, Orsato R, Montagnese S, Schiff S, Kaplan PW, et al. Electroencephalography in patients with cirrhosis. Gastroenterology 201;141:1680-9. Young GB, Bolton CF, Archibald YM, Austin TW, Wells GA. The electroencephalogram in sepsis-associated encephalopathy. J Clin Neurophysiol 1992;9:145-52. Song Y, Prakash R, Reddy J. Prognostic value of somatosensory-evoked potentials in neurology: A critical review in hypoxic encephalopathy. Neurol India 2016;64:396-404. Sharma P, Eesa M, Scot JN. Toxic and Acquired metabolic encephalopathies: MRI appearance. AJR Am J Roentgenol 2009;193:879-86. Rovira A. Alonso J. Co'rdob J. MR imaging findings in hepatic encephalopathy. AJNR Am J Neuroradiol 2008;29:1612-21. Bathla G, Hegde AN. MRI and CT appearances in metabolic encephalopathies due to systemic diseases in adults. Clin Radiol 2013;68:545-54. Schiess N, Prado CA. Hashimoto encephalopathy. Ann NY Acad Sci 2008;1142:254-65. Brouns R, De Deyn PP. Neurological complication in renal failure: A review. Clin Neurol Neurosurg 2004;107:1-16. Sterns RH, Silver S, Kleinschmidt DeMasters BK, Rojiani AM. Current prospective in the managnement of hyponatriemia: Prevention of CPM. Expert Rev Neurother 2007;7:1791-7. Eidelman LA, Putterman D, Putterman C, Sprung CL. The spectrum of sepsis encephalopathy. Definition, etiologies and mortalities. JAMA 1996;275:470-3. Garcıa-Martınez R, Simon-Talero M, Cordoba J. Prognostic assessment in patients with hepatic encephalopathy. Dis Markers 2011;31:171-9. Young B. Neurological prognosis after cardiac arrest. N Engl Med 2009;361:605-11.